On our recent boat trip we passed through the Goolwa barrages and headed south along the Coorong towards the mouth of the River Murray. It is here that Australia’s largest river empties into the Southern Ocean. As we travelled along we followed the line of sand hills which separate the Coorong from the ocean. It places these sand hills are spectacular – more of that for another post. 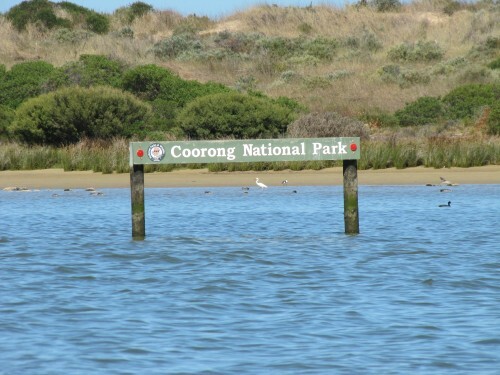 all along this stretch of the Coorong it is hard keeping up with all the birds one sees, especially seeing we were travelling most of the time at 25mph. On several occasions we had to slow down to slow walking pace and keep a sharp eye out for sand bars; more than once we almost became grounded. In the photo above you can see a Little Egret, some Grey Teal and a Eurasian Coot just to the right of the sign. Below the photo shows several Australian pelicans and a Masked Lapwing on the right. Almost impossible to see (except under extreme enlargement) are what look like Sharp-tailed Sandpipers and maybe a stilt. A little further on we reached the mouth of the Murray. Our captain was unwilling to venture too close for fear of bottoming out on a sand bar. I was surprised by the number of vehicles on the beach and the number of people fishing along the shore of the river. I shouldn’t have been – it was a holiday long weekend and the weather was perfect. 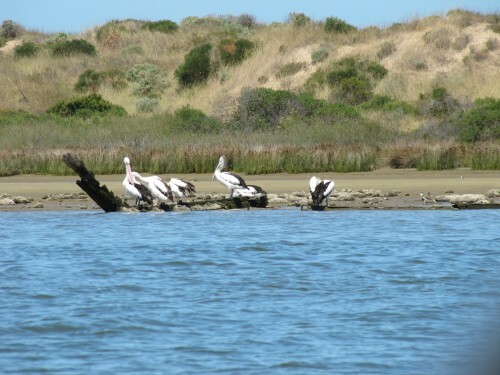 The last photo below shows one of the tourist boats operating in this part of the river, The Spirit of the Coorong. It takes tourists from Goolwa down through the Coorong on a regular schedule. 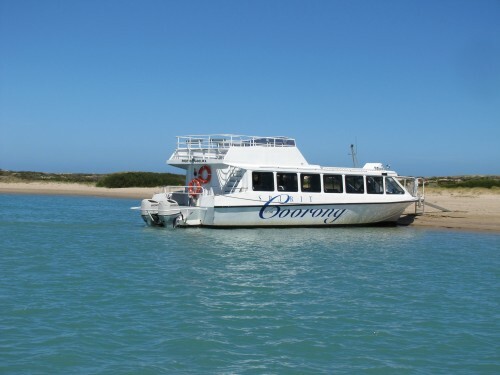 Tourist boat in the Coorong. 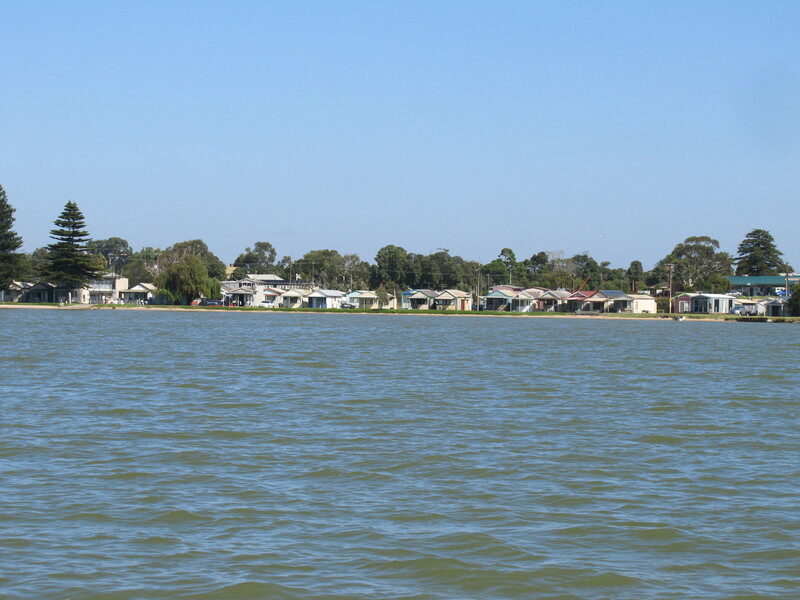 In my last post here I wrote about a recent boat trip on Lake Alexandrina just south of my home in Murray Bridge. While this boat trip was mainly recreational in purpose, I cannot help but notice birds along the way whether I am driving in a car, travelling on a bus or train, walking or boating. While travelling at 40kph (25mph) across the water is not conducive to birding – the boat’s engine scares many birds away – some birds are obviously very used to speeding boats on this stretch of water. Silver Gulls followed the wake of the boat as shown in my last post, Australian Pelicans kept fishing less than 40 metres from our racing vessel, cormorants kept bobbing up out of the water here and there and flocks of ducks flew over the lake heading somewhere else to feed. The photo above shows one of many navigation posts seen at intervals across the lake. The depth of the water varies from a few centimetres through to about 4 – 5 metres. 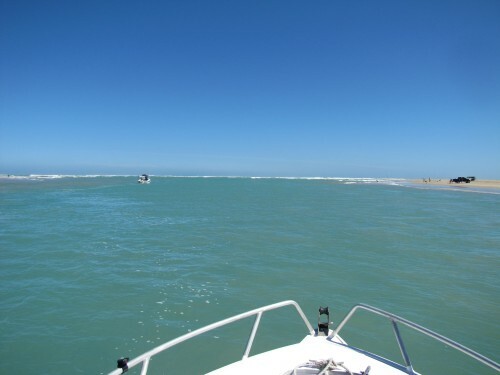 Some sections are far too shallow for safe boating – as we found out later in the day. 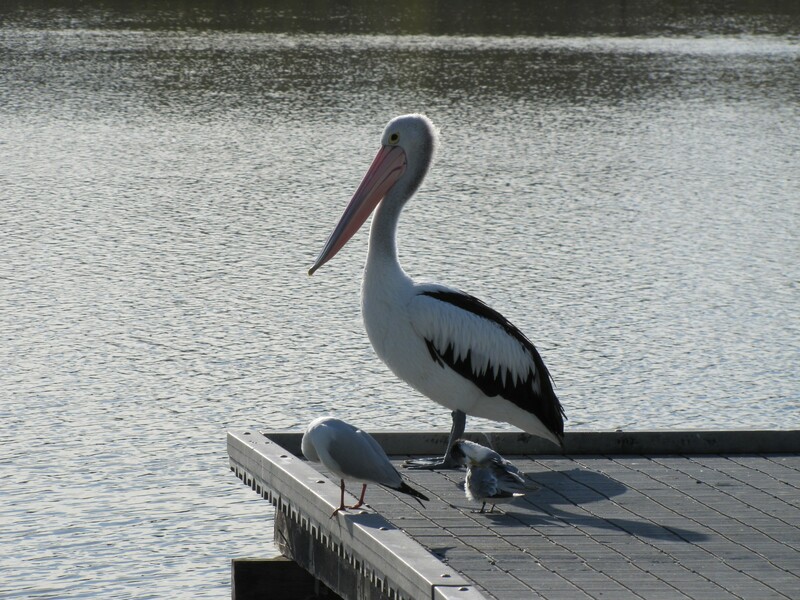 I deliberately captured both the pelican and two Little Black Cormorants in the photo. Little Black and Little Pied are the two dominant species of cormorant in the lakes and river system of the Lower Murray River. 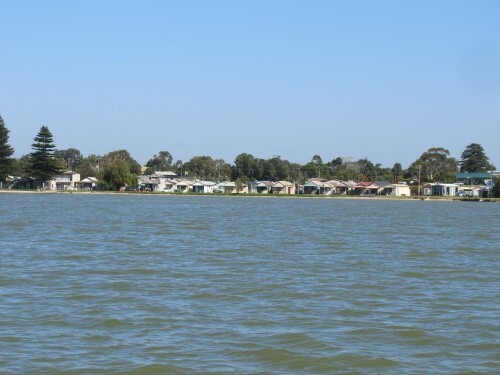 The photo below shows a view of the lakeside town of Milang. I can thoroughly recommend the little bakery in town, and our friends tell us that the fish and chip shop is also worth patronising. A view of Milang from the lake. On our recent holiday on Yorke Peninsula we struck a weekend of wild weather. On Sunday morning the wind was blowing a gale and constant misty showers scudded across the sea and over the adjacent farmland. Undeterred we still went out for a drive knowing that this was the only way we would get to see anything. Walking was really not a pleasant option. We stopped to have a cuppa at Sheoak Beach, parking the car so that we could sit in relative comfort out of the wind and rain – and yet be able to see the water and any birds on the beach. There was not much to see. 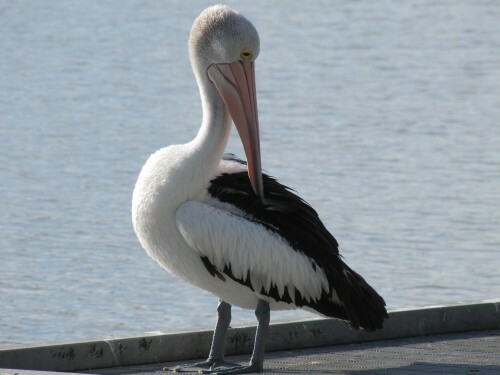 A few Australian Pelicans sheltered from the wind behind some seaweed tossed up on the beach (see photo below). A small flock of Crested Terns sat on the beach looking most uncomfortable in the atrocious conditions. Several Sooty Oystercatchers were hunched up against the wind too, and a few Silver Gulls valiantly tried to fly along the beach. A White-faced Heron also bravely battled against the wind. As we drove off I opened the driver’s side window a little as it was on the leeward side. This was so I could add a few species I heard calling or saw as we drove along slowly. I saw several Singing Honeyeaters, Rock Doves and heard a Common Skylark calling out in a nearby field. As you can see in the photos on this post, the conditions for photography were far from ideal, the misty rain making it impossible to get good shots. Some birding days are like that. 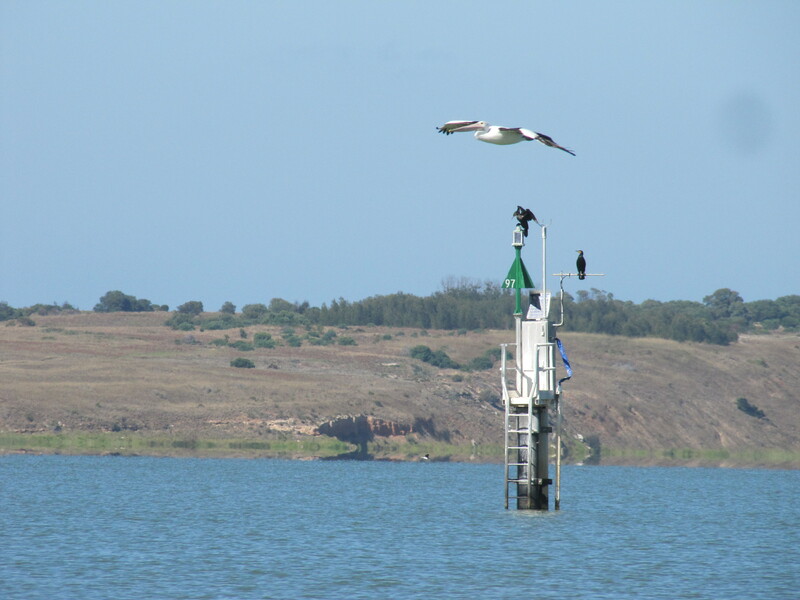 I recently visited Goolwa near the mouth of Australia’s longest river, the Murray. 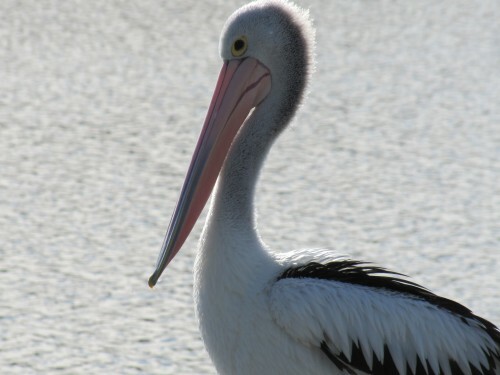 While doing some bird photography in the area this Australian Pelican took off from the river. I managed a reasonable photo of the bird as shown above. One of the challenges ahead of me is to gain more experience in taking shots of birds in flight. Species like gulls and terns can make excellent subjects for this type of photography because they often swoop or glide low overhead enabling good action shots. Slow moving birds like pelicans and eagles can also be good practice. I still have plenty to learn in this area.